Abby here… A few days ago I made a comment on Facebook about making bone broth, and within minutes I get a call from my mom saying “What the heck is bone broth?!”. I thought it was quite funny, but truth be told a year ago I probably would have asked the same thing. In fact, a year ago I probably wouldn’t have touched a chicken carcass with a ten-foot pole. I guess I was a little late to realize the benefits of making my own bone broth, but now that I know what I know I am all in. So it turns out that homemade bone broth (otherwise known as stock, such as chicken stock) is really, really good for you. I call it bone broth, because that is the whole point of making the stock… to get the benefits from the bones! Truth be told, I was going to write out a list here. I was going to most importantly write about the health benefits like minerals and gelatin, and then also how it is cheap and tasty. But instead I’m giving you this link. It’s a fantastic article that breaks down literally everything good for you in bone broth. Please read! I want to add that store bought broth is not the same!! Almost all, including several “natural” or “organic” varieties, are watered down and have additives such as coloring and preservatives. In my opinion, any food with a 3 year shelf life should be questioned. When making chicken broth, I place a whole chicken in the crock with salt and pepper and cook on low for about 4 hours. You could also bake the chicken in the over like Jeanne does here. 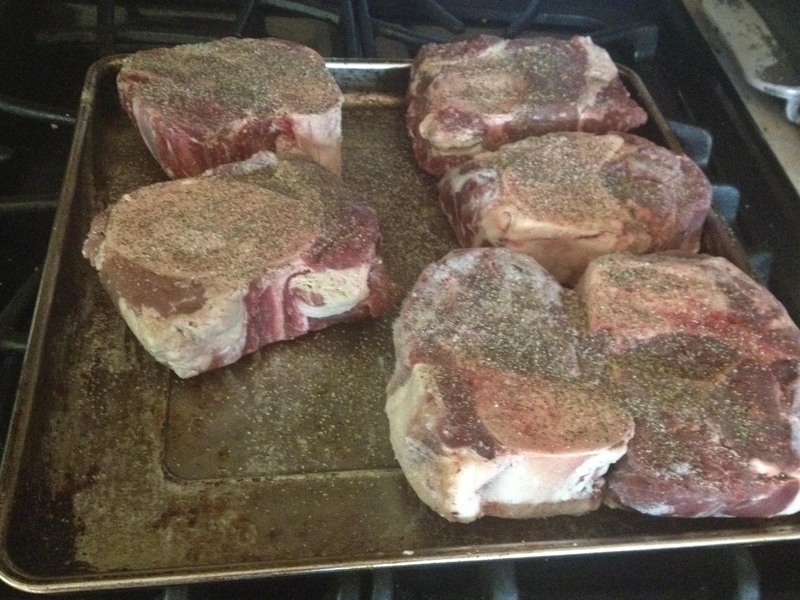 If you are making a beef broth, bake the beef bones on 350 for about 30 minutes before putting them in crock. Our family purchased part of a cow so we got these bones with that purchase. Most butchers have bones available if you just ask… sometimes even for free! Once the chicken is cooked, remove from crock and pull off meat. After that, place what’s left of the chicken (bones and all) back into the crock along with any veggie scraps you have such as onions, celery and carrots. Same goes for beef broth… add the bones and veggies into the crock. You can add salt (2 tsp) and pepper and other seasoning if you like, but don’t have to. Personally, I like salty! Add 2 tablespoons of apple cider vinegar (this helps draw out the minerals from the bones) and then fill with water, leaving enough room so it doesn’t bubble over. Cover and simmer on low for 12-48 hours. The longer the better, and I usually end up somewhere around 36 hours. Check back periodically, and add water if needed. Once your broth is done, turn off crock and strain. When I am doing this by myself, I find it easiest to first fish out all the large pieces with a slotted spoon. If there are any large pieces of carrot or celery I set those aside for this little one, because he gobbles them up. After that I strain everything into a large glass bowl where I refrigerate overnight. The gelatin up top is a good thing, but you can remove it if you like. Pour into pint or quart size glass mason jars. My large crock pot typically makes 3-4 quarts. If freezing, cover loosely with plastic and gently place in freezer… or in the fridge with lid if you are using it this week. The reason for the plastic is that glass can be a little finicky when freezing, and this allows the broth to expand a bit before it is under the pressure of a lid. Also, wide-mouth, shoulder-less jars are best for freezing, but I just used what I had available. After 4 hours or so the broth will be frozen. Now you can remove the plastic and loosely seal the jars with their proper lid. I love having a freezer full of broth I can use anytime I need. It is perfect for soups, and with winter coming I think we will all be making a lot of those! I love both your’s & Jeanne’s great ideas & info! Never would have dared to freeze in glass jars before, thanks for shoving how to it is done simply. What kind of crockpot do you use? I have never used but have been wanting to buy one, but I have been wondering about the coating in them (how safe are they )? What size of the crockpot would you recommend? Hi Kaisa! Sorry it took me a few hours to get back to you. I use a Kalorik slow cooker. I have been frantically looking for the info I read at an earlier date regarding it having a lead-free glaze, but honestly I a having trouble verifying it right now. Seriously that you for reminding me to double check that! As far as I can tell, the Vita-Clay slow cooker is that only one out that is certified lead-free. Looks like I may have to see about getting one. Thank you so much Abby! I just ordered one 🙂 !